Created three years ago for a competition and one of his first big creations, this coral reef was built when Orlando Hay was only 11! Looking good enough to go diving in, it’s constructed with a variety of interesting and novel piece choices. Moon tires make wonderful anemone, clear round 1×1 bricks make convincing bubbles, and various technic pins make the ocean floor look textured. 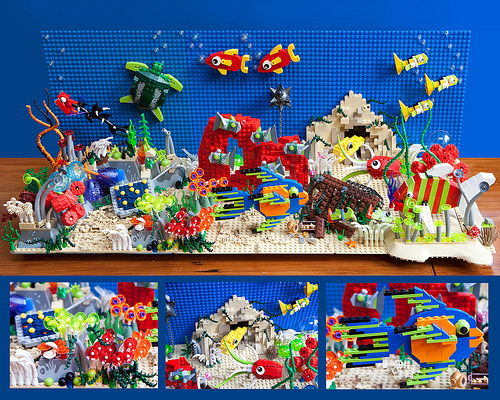 This colorful underwater scene contains a plethora of piscine and invertebrate inhabitants as well as an eel, squid and a turtle all sitting on a carefully hidden LEGO moulded baseplate. No reef would be complete without shipwreck and treasure, but if you plan on going diving just watch out for that mine and the shark chewing a flipper!